(Milton, DE) - Have you ever heard a pear sing? Here at Dogfish Head, we've been playing around with off-centered hybrids since the mid-90s. We do beer-wine hybrids like Noble Rot and Sixty-One using grapes as fermentable sugars, and we do a beer-cider hybrid called Positive Contact using apples. For Piercing Pils, our new winter seasonal, we've brewed a beer/perry hybrid with pear juice. And although we usually prefer the spicy, robust possibilities of ales, this one is a Czech-style pilsner. Hmmm. A winter seasonal that’s not dark and roasty? That’s right. 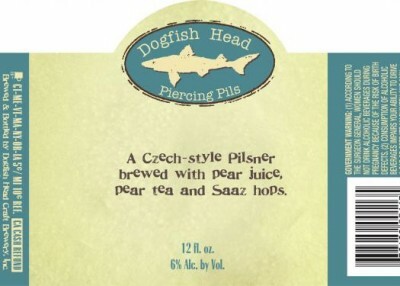 Once again, Dogfish Head is zigging when everyone else is zagging, and we think you’ll love it. The complex pear notes pierce right through the spicy Czech Saaz hops and add a gentle acidity to this crisp, refreshing lager. A late addition of white pear tea amplifies the fruity aromas and helps the pears sing. It's quite a chorus. The 6% ABV Piercing Pils, which started its life as a popular brewpub exclusive, will be available in 4-packs of 12-oz. bottles and on draft. Hey! What about Chicory Stout, you ask? Well, Chicory is a house favorite here, so we couldn’t bear to part with it entirely. It’ll still be available on draft in limited quantities. Watch for Piercing Pils starting Dec. 1!